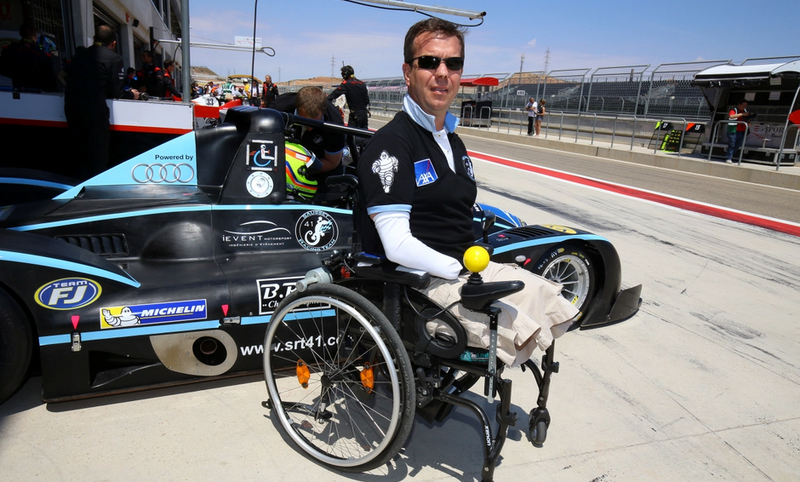 Frédéric Sausset is a quadruple amputee, but that won’t stop him from racing in this year’s 24 Hours of Le Mans. Here’s how he’ll pull it off. While on vacation in southwestern France in 2012, Frédéric Sausset, a 47 year-old French businessman, sustained a scratch on his hand, which developed into a potentially deadly infection called purpura fulminans. After battling the infection, Sausset fell into a coma and later awoke with his arms amputated at the fore-arms, and his legs cut off just above the knees. Luckily, Sausset survived the endeavor, but struggled psychologically in the months following his operating. That’s when, according to Autoweek, he decided upon a new goal to “give [his] new life a purpose.” That new goal was to race at Le Mans. It wasn’t going to be easy, as Sausset could no longer use conventional car controls, so his vehicle, a Morgan LMP2, would need modifications that would require bending some rules. Lucky for Sausset, he met Vincent Beaumesnil, an organizer for LeMans, who was moved by Sausset’s ambition. Moved by Sausset, Beaumsensil offered up Garage 56 to the quadruple amputee, a spot on the grid at Le Mans normally reserved for cars “displaying innovative technology” (like the Nissan DeltaWing, which filled the spot in 2012). And in a way, Sausset’s team does display innovative tech, especially if you look at how his team, SRT41, has modified the car to work for not only Sausset, but also his two teammates, Tinseau and Jean-Bernard Bouvet. Sausset steers via a prosthetic, which links the remainder of his right arm to the steering wheel. As for the brake and gas pedal, Sausset activates those via paddles on the seat, which he presses with his thighs. Those paddles then apply the gas and brake pedal via removable linkages. Sausset’s car also gets ABS, a fully automatic gearbox, and, arstechnica says, an ejector seat to overcome the rule requiring drivers to unbelt and exit the car in under seven seconds. My hat’s off to the SRT41 team and to Mr. Sausset, a man whose ambition drove him to achieve his dream against all odds.